After a brisk walk, serve a small mug of this tea to your adult guests, to warm hands and soul. Place 2 Waitrose Earl Grey Tea Bags in a jug, cover with 500ml boiling water and allow to stand for 2 minutes. Remove the bags and add 2 tablespoons clear honey and 200ml Scotch whisky. 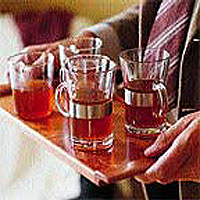 Mix well and serve in small mugs or glasses.